If you have been lusting over the Chanel two-tone slingbacks, like me, well you’re in for a treat today. I have found the perfect pair of dupes, for a fraction of the price of course. This gorgeous pair is actually from Mango. Although the color combo, black and beige is flipped from the original Chanel design, it’s still as beautiful. The heel is also slightly higher, which personally is better in my opinion. Once you wear them, though, people will definitely mistake them for Chanel. I have to say, Mango has been killing it recently. If you’re not familiar with this brand, well you should definitely put it on your radar. It’s like Zara, but slightly better. If you have a hard time with Zara’s shoes, I know I do, you’re going to love Mango. My most loved pair of boots is from there as well. Just like all my Mango shoes, these gorgeous slingbacks are so comfortable. You can wear them all day long without suffering. The best thing about these shoes is that they only cost $59! Go ahead and buy them now…. it’s Ok, I’ll wait..
I’ve been wanting shoes like these and I love the dupes that you found!! Thanks, babe! I’ve seen Mango, but haven’t ever tried anything from them! Thanks for the recommendation—I always feel safer knowing someone I trust had a good experience! I love your shoes and the dots print of your blouse is so pretty ! Love those shoes! So chic and such a great price point! I love everything about this look! Those jeans look amazing on you. Love the shoes! I wish I could afford a pair of this slingback, it’s stunning and timeless! I love this top Tamara, it is so pretty and I love how you styled it. These shoes look so comfortable. I will go and check next time I am shopping. What a great dupe you’ve found, girlie! I love them and I love the way you’ve styled them here with that beautiful printed blouse and that fun clutch, you look so street-chic! I, too, love Mango, though I don’t believe I’ve purchased anything from them before, but my mom has! You’re right, it’s much like Zara. Thanks for sharing, beauty, and I hope you’re having a great week so far! I also got a pair of Chanel dupe heels but from Zara. I love how those brands can make fashion so affordable although it is very bad in other ways. Have a nice day gorgeous! These are amazing dubes!! <3 Thanks for sharing. I love a good dupe. This was a good find that’s affordable. Cool post! Stunning shoes! Love your cute top too! Those shoes are so cute! I’ve definitely walked by Mango before, but I’ve never actually shopped there. I love Zara, so I’ll have to check it out next time. Looks great on you, nice photos! These shoes are so gorgeous. I’ve never bought anything from Mango but I will definitely check them out. $59 for those beauties!? What a steal! very cool and stylish look! Dear friend, the outfit is so cool! Love it! What perfect dupes! They are so beautiful! Mango has the best pieces, one of my favourite stores! Those shoes are so fab!! They are seriously the most perfect dupes! These shoes are too cute! Def a perfect dupe for the Chanel version! You’re so beautiful, lovely look! These slingback are so gorgeous!! I totally thought that they were Chanel too! These are such awesome Chanel dupes! Such a classic wardrobe item! Perfect dupes! Love this whole look! So cute and affordable! I love Mango. This look is so great! I absolutely love Chanel flats but I think they are a little overpriced for what they are. 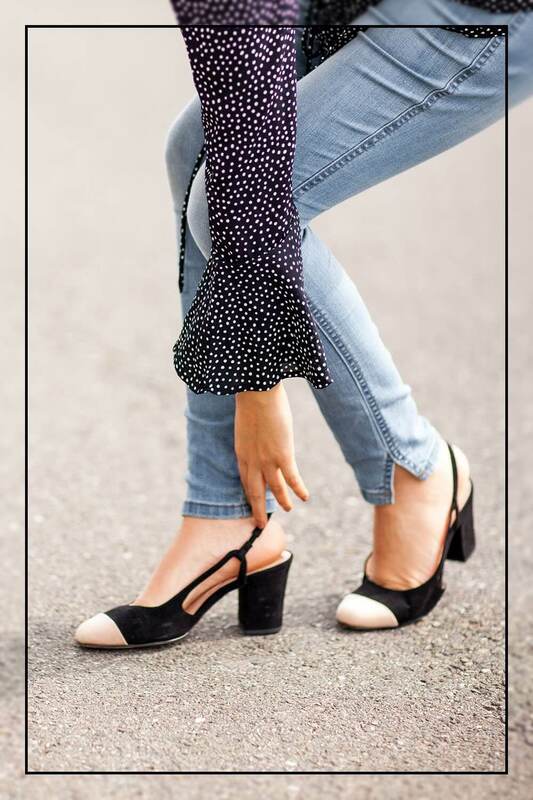 These slingbacks are such a good alternative. I might actually get myself a pair!